The Methow Valley is a land of subtle magic. Its light carries a physical presence. It is classic cowboy country with hippie-athletic sensibilities. The valley contains just the right proportion of lazy rivers, rugged mountains, broad foothills and ethereal sunsets that paint the landscape with lingering golden hues. Equal parts Western Montana, Rocky Mountain Colorado and eastern Cascades, the Methow (pronounced mett-tao) feels oddly curated to the exact specifications of what one needs without any of the stuff one doesn’t. It is not surprising to see both American and Canadian flags flying as the Methow is roughly 30 miles from the border. Situated just east of the North Cascades, the Methow Valley encompasses the communities of Mazama, Winthrop, Twisp, Carlton and Methow. 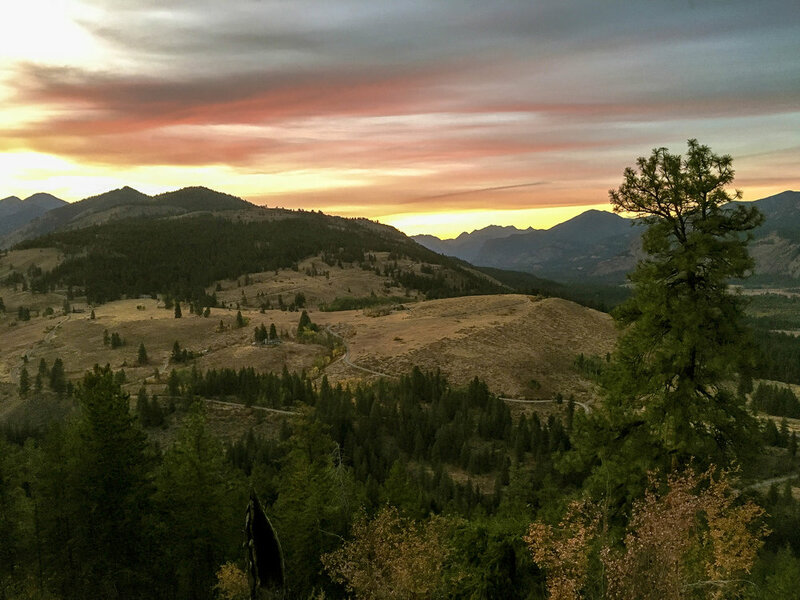 This concise 33 mile loop is an accessible entry point to the Methow, showcasing a rolling cross section of meandering forest road, bucolic river valley and expansive bunchgrass prairie with just a teaser of the Methow's inimitable trail system. The Methow trails contain over 120 miles of singletrack over USFS, Fish & Wildlife lands and a complex of private properties over which Methow Trails have provided access via long-term agreements with landowners, an incredibly rare arrangement in the American West where almost invariably private property is regarded with a fierce quasi-religious protectionism. Starting and finishing in the Sun Mountain trail system, there are a host of optional configurations available to bookend the loop. This particular version as shown is merely one example of many. We opted for Sunnyside to Beaver Pond trail as means for connecting to Thompson Road, thus beginning the only significant climb of the route. 1000 feet over 3 miles. Well-maintained Cadillac gravel. Nothing too difficult here. Through this stretch you will notice quite a few bits of wonderfully signed MTB singletrack crossing Thompson Road on either side. Many of these are new trails very much still in the process of being built. 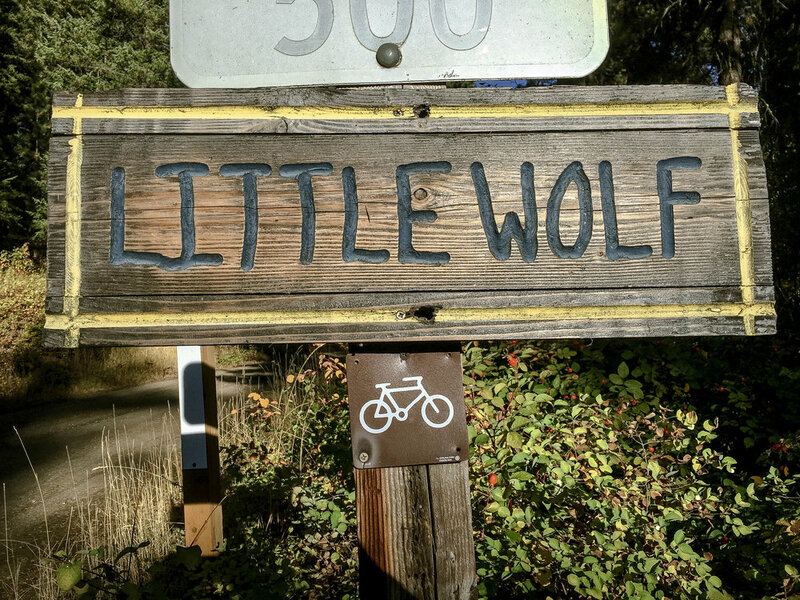 From the high point of the loop around mile 7, Thompson Road drops into a wonderfully luxurious 1500 foot descent to intersect with Twisp River Road. The corners are perfectly banked and the gradients reasonable as the road winds effortlessly in and out of amply-spaced pine and alder groves underlaid with radiant fall shrubbery, eventually breaking out into fully exposed grassy meadows overlooking the Twisp River. Rolling downward still, the loop transitions to pavement en route to Poorman Creek Cutoff, tracing the lazy contours of the river heading eastward. 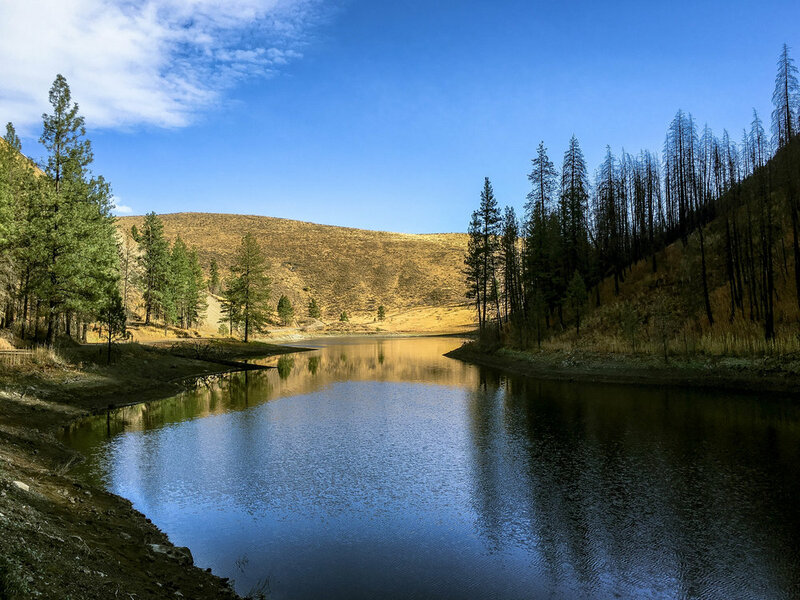 While our version is relatively concise, there are plenty of opportunities on the Twisp River side for larger, longer loops, one of which involves Buttermilk Creek, Black Pine Lake and Poorman Creek Roads. 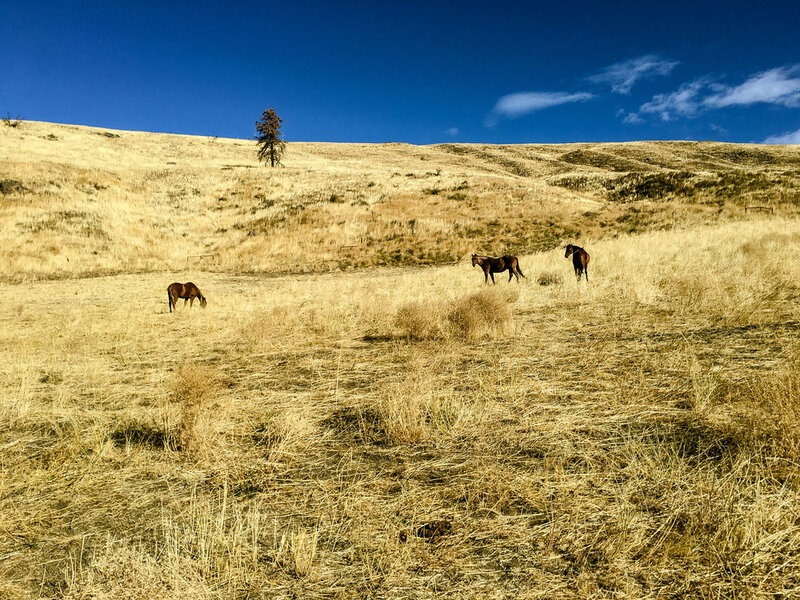 Our circuit however, once reconnected with Twisp River Road, returns westward to the golden hills and wideset bunchgrass prairie of Elbow Coulee. The figure-ground relationship of bold evergreen against the golden grasslands epitomizes the iconic eastern Cascadian color palette. Elbow Coulee climbs gently toward Patterson Lake over wide, smooth maintained gravel, reconnecting with pavement at the junction with Patterson Lake Road. Around mile 32 there is an oppotunity to jump back into the Sun Mountain trails for any number of singletrack options back to Sun Mountain, all of which are going to require some spirited trail climbing. For what its worth we tried both the Black Bear to Moose and Kraule trail configurations, the former significantly steeper than the latter, and found them both to be quite wonderful! In the Methow area, I found myself returning to a few go-to spots. The Copper Glance is a mixology-grade cocktail and wine spot with a solid tap list and well-rounded if not slightly boilerplate foodie fare. The Old Schoolhouse taproom offers a standard lineup of solid craft brews in a well-worn, slightly claustrophobic interior setting but offers both outdoor beer garden and full service pub-grub patio seating directly on the river, its key distinction being that it is the only craft brew op in Winthrop. A couple clicks west is the Mazama Store, the default focal point of the community of Mazama. It is equal parts camp store, mercantile, community center, bakery, espresso stand, bottle shop and upscale micro-grocery. The Mazama store also serves as a waypoint for PCT hikers. Methow Valley Cycle & Sport is basically the only game in town in terms of bike shops. It is mostly MTB + nordic skiing focused, but with an ample array of tools, supplies, service and necessaries. Blue Star Coffee Roasters is located in Twisp, a few miles east of Winthrop, specializes in small batch, artisanal roasting. Drinks are meticulously prepared to Portland-grade standards. Well worth a visit.